Written in Projects: 05/17/13, 05:03:29 by admin | Print article | View all categories. Forest Friends Ireland Biodiversity Programme May 19th to June 6th 2013 announced ...|admin|1368792209|Forest Friends Ireland are proud to announce our activities for National Biodiversity Week. National Biodiversity Week will take place this year from Saturday 18th May to Sunday 26th May, with the UN International Day of Biodiversity being celebrated on 22nd May. Forest Friends Ireland have arranged the following programme with the objective of creating awareness of the importance of biodiversity and the value to the local, national and international community. Sunday 19th. Biodiversity Walk, Ballyboughal, Fingal. Forest Friends are linking up with the Ballyboughal Hedgerow Society for a Biodiversity walk to take in hedgerow biodiversity wetland areas and amphibians. Ballyboughal Hedgerow Society was founded in 2000 the same year as Forest Friends, to raise awareness about the local hedgerows which are linear forests, and their biodiversity and amenity value. Monday 20th. 3.30-4.30PM ENVIRO special NEAR 90.3 FM. Special edition of 'Enviro', entitled the 'National Biodiversity Week'. This programme will present details of the biodiversity week programme and interview a representative of the National Parks and Wildlife Service. The programme will be presented by John Haughton, President of Forest Friends Ireland. Tuesday 21st. Marino Library 14-20 Marino Mart, Fairview, Dublin 3. Presentation of the Forest Friends Tree and Forest Water Biodiversity Project, an audio visual presentation which will be circulated to all the libraries and schools in Ireland. This project will examine the effects of the acidification of waterways due to the predominance of monoculture tree plantations in Ireland and the effects of the use of cypermithron a persistent carcinogenic immune-damaging pesticide. The presentation will examine the role of trees and forests in the movement and purification of waterways, and how this assists the creation and preservation of biodiversity globally and locally. Starting Time 18.30 hrs. Meet in the public car park Santry Woods at the Morton Stadium end. The walk will be led by John Haughton, President Forest Friends Ireland and Laetitia Beschus, Ecologist, Forest Friends Ireland. Forest Friends will conduct an audio visual presentation to students at the school as a first step in the building of a pond at the school. This is a follow up to last year's Forest Friends biodiversity project 'Hop for Frogs' which took place during biodiversity week in Gardiner Street Primary School. Forest Friends will complete a plan for the ideal garden pond, suitable for schools and communities,covering all aspects of design. This will be made available through libraries, and to community groups schools and local news media. The project is being launched with a view to building a pond at Belmayne Educate Together National Primary School. The design will cover all aspects, including, site selection, dimensions, materials required, depth of water, volume of water, aeration, temperature control, safety aspects, suitable plants, stepping levels, marsh areas, the importance of frogs from a biodiversity point of view, causes whereby frogs have become endangered species worldwide, newts, the importance of frogs from the gardeners point of view, their role in ecosystems locally and globally, protection of pond life from predators. 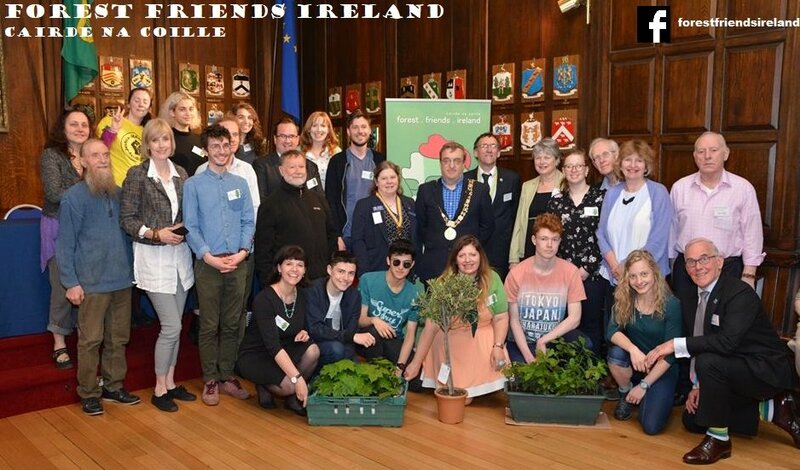 Forest Friends have been one of the prime movers in initiating a Peace Forest.and on Sunday May 26th the Rotary/ Cross Border Peace Forest (Ireland) in association with Forest Friends Ireland will be launched with the ceremonial planting of Oak Trees by Sakuji Tanaka President Rotary International . Oak trees have been sponsored by Van Der Vel Ltd., Aughrim, Co. Wicklow, and Gallinagh-nursery,County Donegal. The President of Rotary International will launch the project at 10-45 am in St Columbs Park. The Peace Forest will in time involve tree plantings all along both sides of the border dividing north and south Ireland, with communities playing a key role. These initiatives will be facilitated by Rotary clubs, Forest Friends Ireland and other partnership organisations. Also during the Peace Forum an audio visual production of the biodiversity of the Foyle River/Derry Londonderry section, prepared by Forest Friends Ireland will be presented to the Derry Londonderry Rotary Club. A presentation will be made to students of the Bayside Senior Primary School, Bayside, Sutton by Forest Friends Interns describing the "Home for Frogs" garden pond schools project. If you require any further information on our Biodiversity Week activities please contact info@forestfriends.ie or from our office at 55 Fairview Strand, Fairview, Dublin 3, Ireland.